This is a quick look at how I whisk up the famous honey mustard salad dressing that I mentioned in a previous post on putting together impromptu healthy salads. 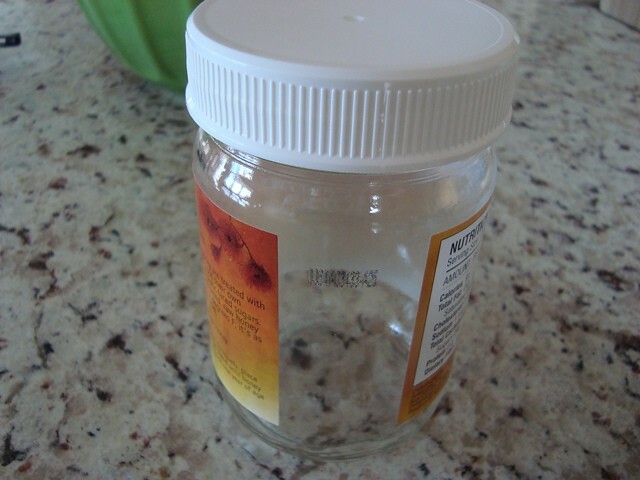 First, it's best to start with a see-through jar that comes with a lid. This will allow you to roughly eyeball ingredient proportions as you bring them together, and store unused finished product in the refrigerator. Sorry we are no longer able to source this honey! Please note that "one-third" doesn't necessarily mean a third of the jar, but just a third of the total amount of dressing you'd like to make, and this will hold true with all amounts cited below. Next, add about one-fourth freshly squeezed lemon juice. That's just a little less than the amount of extra-virgin olive oil you started with. Next comes about one-fourth of the best honey you have access to. Then about two good tablespoons of your favorite mustard. 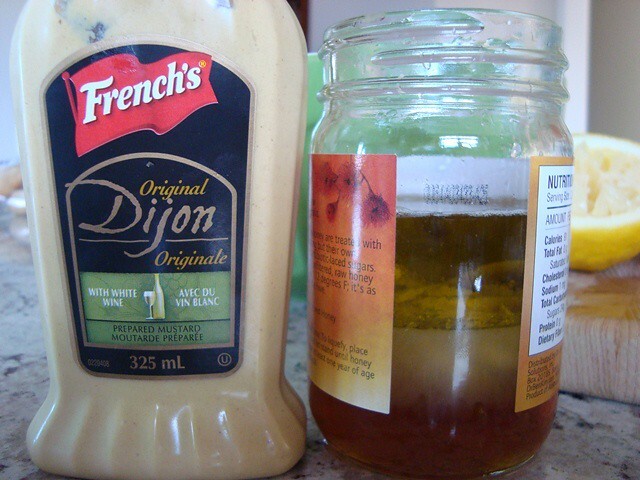 We like to use Dijon mustard for the mild spiciness that it brings to the mix. And finally, a good pinch of sea salt plus about a teaspoon of minced garlic. Now the most important part: give it a taste test with a fresh, crisp leaf of lettuce. Yowsers, makes my mouth water just to think about having a huge bowl of greens with this lemony fresh dressing. If you have any salad dressing recipe ideas to share with our community, please use the comments section below. Many thanks. I love this website, Dr. Benkim! I like to utilize the benefits of 100% organic virgin coconut oil and also raw apple cider vinegar as well, so I use the lemon/vinegar and olive/coconut oil in equal parts along with the rest of the ingredients you mention. 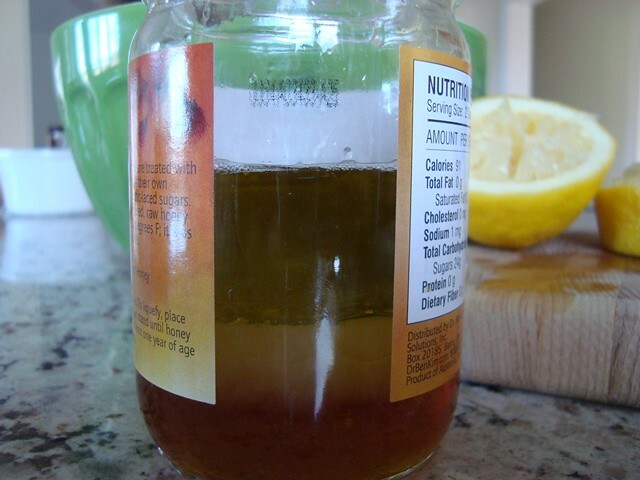 For those who want to avoid the high fructose content of the honey (albeit the enzymes and other nutrients give the raw honey its redeeming value): skip the honey, decrease the lemon just a bit and replace that amount with raw apple cider vinegar and add a good pinch of salt, freshly ground black pepper and oregano. 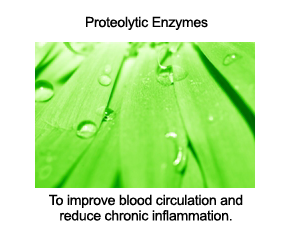 The juice from sliced organic tomatoes on the salad will also greatly enhance the flavor. hi! i find it quite funny that i JUST made my own salad dressing last week, for the first time in YEARS, and it is VERY SIMILAR to the recipe you shared with us. only thing is i didn't put dijon into it- instead, i added a few tablespoons of liquid amino acids (Bragg's brand), instead of the soy sauce my recipe called for. Or, splash some Aminos all over the lettuce, then pour on the dressing. gives it a salty kick, and as far i know, it' very healthy for us! Hi... 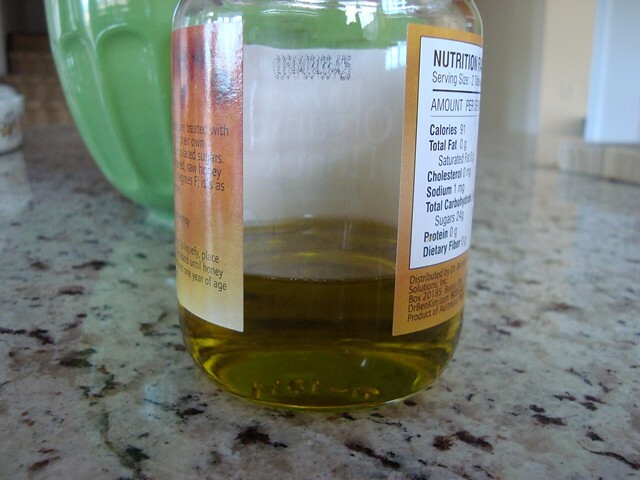 I have been a long time user of Bragg's Liquid Amino's and I use their apple cider vinegar as well. I just found out that the main ingredient in bragg's liquid amino is another form of MSG. I was very sad to know this and have stopped using it. I thought you would like to know this info as well? Here is a link w/ all the data and facts you need to know on the subject of MSG and it's "other forms" and why it's bad for us. The article is written in an interview format between health advocate Mike Adams who has a website called Natural News and Dr. Russell Baylock who is a board certified neurosurgeon, author and lecturer. My eldest brother managed Sexton Foods Inc in Indianapolis, Indiana 10 years ago. Braggs came to them to see about having Sexton bottle the liquid amino. They trned Patricia Bragg down because when they tested the liquid it did NOT have all the ingreidents that the label stated. Sorry Patricia. That's right from the "horses mouth". How disappointing to hear that about Braggs liquid amino's. I was just about to get another. I hope the apple cider vinegar is ok !!?? This is definitely a keeper! 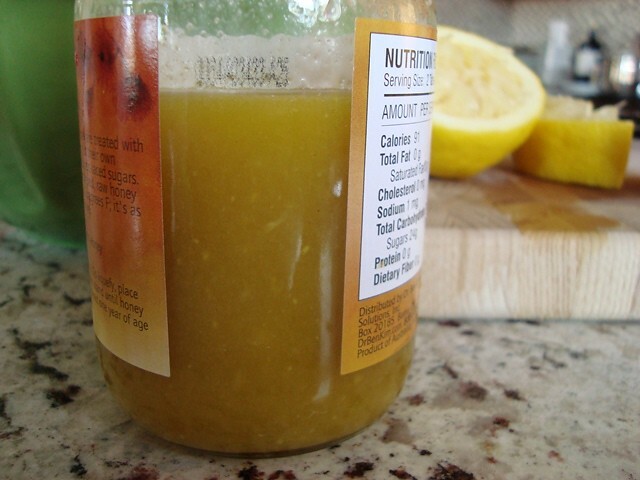 I have been making the same dressing for some time but I occasionally use Bragg's apple cider vinegar in place of the lemon juice, or depending on what mood I'm in, a mixture of the two. I also add a generous helping of fresh cracked black pepper. Sometimes we crave a little heavier dressing so I add a large dollop of fresh made mayonnaise and we end up with a "creamy" dressing....like a Creamy Vinaigrette. Every once in a while when the salad itself is the whole meal and calls for an exotic note, I add a spoon of raspberry all-fruit preserves to the original dressing to make a Raspberry Vinaigrette. Delicious! As long as you use real ingredients you can't go wrong! 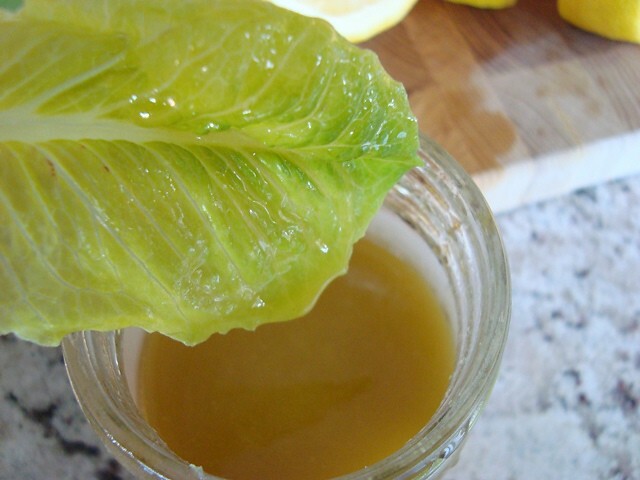 I have an easy salad dressing that tastes delicious! Like you, I used a pint jar with a secure lid. Adjust the ingredients to your taste. If too tart, add more water. 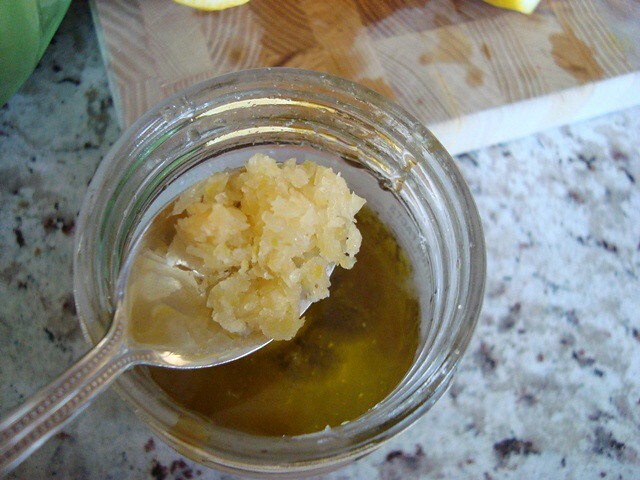 One of the most delicious dressings I've ever had was 1 part Braggs, 1 part freshly squeezed lemon juice, 1 part olive oil, and lots of freshly peeled and pressed garlic. YUMM-MMY! My basic salad dressing is similar to Dr BenKim's recipe except that sometimes I replace the lemon wth balsamic , wine, apple or any other vinegars. As for the honey, I have replaced wth chutneys, fruit preserves and jams. The fruit fr the jam gives a hint of dif fruity flavors. At times I even crushed in serai or citrunella or kiffir lime leaves or bunga kantan or daun kedok (unsure of d names in Eng). Infact any strong herbs and fruits( longans, durians, jackfruits) will give yr salad dressing a new flavor, Adding wasabe or sesame oil, oyster sauce , curry paste or miso will also create interesting salads. But never never combine flavors. Hey be brave - have yet to try wth choc n coffee! Sounds familiar! My mentor is Chef Michael Smith. 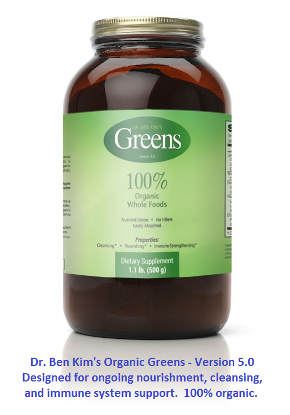 Eating more greens with your Lemon Dijon dressing. 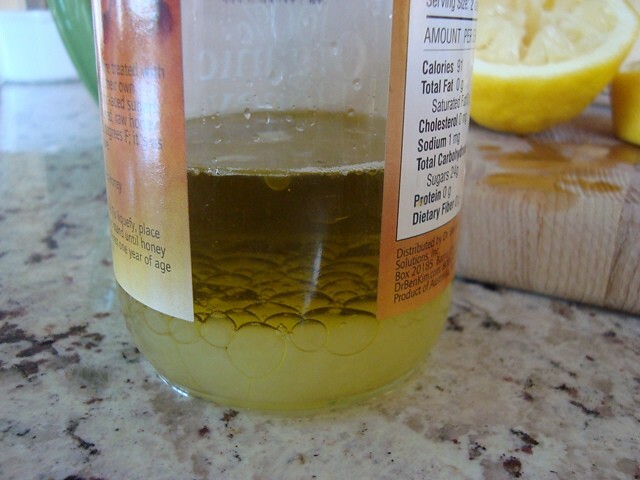 Thank you Dr. Kim for this wonderful fresh & tasty Lemon Dijon salad dressing. I like the way you show the photos and ingredients in the instructional. I am keeping the ingredients for this always on hand now. So easy. You only need to drizzle on a little for a power punch of flavor. I hit it with the immersion blender and it whipped up real creamy. Looking forward to more healthy recipe ideas. I absolutely love your recipes. this looks like a great salad dressing, I am going to try it asap. We appreciate all the descriptive recipe posts on better eating, Dr. Kim. twist than the lemon/garlic, etc. But so good if one can do REAL maple syrup. This recipe is wonderful on steamed veggies, especially broccoli, kale and collards. Put 1/3 cup organic tahini in a jar with a lid, add 2 tbs Braggs and 2 tbs balsamic vinegar. Add enough water so that when it's all shaken together, you get a soft creamy consistency. Adjust Braggs and vinegar to taste. Pour onto your freshly steamed, hot veggies. Yum! Your salad dressing is the one I always use, but more often than not, I mix a heaped teaspoon of green pesto in. And if I want it to be creamier, I would also add some plain yoghurt. Beautiful! Maybe because I grew up with unsweetened salad dressings, I would absolutely not enjoy this one with the honey. I think it is like with e.g. coffee - if (or, once) one is used to drink it without sugar, one doesn't enjoy to drink it sweetened. For those who like to add sugar (or similar) into a lot of dishes: It takes just a couple of weeks to get used to it without the sweetening - and you surely will be glad you did so, and wont be able to believe how you could sweeten all of that. I love this recipe! Absolutely brilliant! I tried it just now but to add a twist I added some ground and whole toasted sesame seeds. Gives the salad dressing an extra bit of texture and crunchiness. Thanks for this post! I have not long ago made this and it is divine! I make this and I also add Worcestershire and some balsamic vinegar and some herbs . Delish! Thanks, Dr. Kim! I love this recipe :) It is even easier with an immersion blender...you don't have to chop the garlic and it is very smooth. It is also great if you substitute line for the lemon, and add cilantro and avocado.